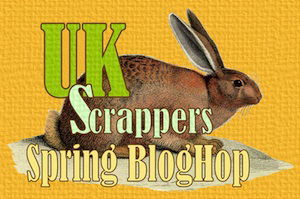 A Big welcome to the UK Scrappers Spring Blog Hop . Sorry for the amount of photos! When i first started to scrapbook, I fell in love with vellum and bought LOTS of it!! I started with the plain stuff and used it to make the pergamano cards and projects - I still have a kit with the pricking tools about somewhere. As well as the beautiful patterned and coloured vellum, I bought iridescent, glittered and printed ready to colour in. I have used a piece of this for my project. I am aware that printing isn't easy as the ink takes so long to dry-you CAN play with the printer settings and use less ink and a faster drying time but I am far too lazy for that! sprinkle with fine clear embossing power- you can use other colours - i have used gold - the most important thing is that it is ultra fine. then dry gently with a heat gun. Sometimes the embossing power comes off but I really like the effect and more importantly, the ink will dry. Photos look great too - I haven't embossed these but just left them to dry or helped it along with the heat gun. I always keep my embossing powder in a big tub right next to the printer so I can get it onto the project as quick as possible. This is what it looks like straight out of the printer with the embossing powder on it. This is the one I shall be using for my card. Don't try to be greedy and print up too much like me! I got one of the images smudged. I am pleased with how the words turned out. I added some pearls and bling, a mount , some ribbon and DONE! The "lace" is die cut - you can also use a boarder punch. The iridescent butterflies are from an upcoming project and are diecut with a memory box die. The heart and butterflies were also diecut. More vellum butterflies this time layered over paper to give a 3D look. There are SO many ways to use it that I will always keep vellum in my stash to use ( not that It has a chance of running out!!) I haven't even mentioned tearing or using embossing folders- ooo imagine the new Tim Holtzs folders or Tri embossing with ink! ..off to play. Don't forget that to have a chance to win the FAB UKS prize , you need to comment on each blog - Good Luck! Fab ideas... I bought a pack oh plain vellum at a raft fair recently but have on managed to add some extra wings to butterflies so far... Will have to try your heat embossing using printer ink technique. Well dim as I am I never thought about printing on vellum! And I love the embossing on it. I will hook out some I have stashed away and have a go. Your cards are gorgeous. Thanks, Sue. I think vellum is making a comeback so you might well have further use for those. I have printed and embossed on vellum but hadn't thought to colour in after...that is clever. Thank you for sharing. Great photos and an interesting tutorial - I used to do this years ago when I made lots of cards and it brings back fond memories:) Thanks for sharing. Its funny how soon we forget how good a thing can look ... thanks for reminding us. WOW! Totally inspiring :) I've got heaps of vellum sat doing nothing. Will have to dig it out now! These look gorgeous, and I have loads of unused vellum gathering dust. Maybe I'll get to use my stash of vellums know they are so nice but I never know what to do. Ooooooooh lovely card, I haven't quite got the confidence to print onto vellum yet, is your printer laser or inkjet? Thanks for tips on using vellum - have some but have never used it as I haven't had a clue how - thanks to you I do now - printing on it sounds a great idea and one that I will try and the embossing on wet ink is genius - thanks for sharing that. Going to dig out all that old vellum from the back of the cupboard! Oh Sue, thank you - now I know what I'm going to do with my collection of vellum! Thank you thank you thank you!!! Wow, these are great! I love the idea of vellum but struggle to actually use it! I've never tried printing onto vellum but would love to add it to layouts. We used most of our vellum or gave it away when mistakenly thinking we would no longer be crafting, but we'll be looking out for more now as this is a fabulous idea. We'll remember the tip about not smudging as we're guilty of that with inking as it is. absolutely love it - it's great. will have a go at this - have done it before, but it's been pushed to the back of my mind. thank you for the inspiration. Wow Sue, what a lovely collection of vellum creations. I love vellum but very rarely use it - will have to give it another go after seeing all these super ideas. I *was* in love with vellum a while back ... I might have to revisit it now as your heat-embossed and coloured images are gorgeous. What's your advice for adhering it to projects? thanks for sharing this. I will dig out my vellum and start using it again. Great way to use vellum, didn't know you could print and than emboss on it. Gorgeous cards- so much to look at! I hadn't thought of embossing on the vellum, super idea. Thanks. I just found an old stash of vellum the other day and was musing on what to do with it ... Now I have loads of ideas! Will try the embossing-straight-from-the-printer trick. Thanks for the tutorial, must try embossing on vellum, looks very effective. I think we will all be digging our vellum out now - beautiful projects and ideas - thanks for sharing. Gill x UKS name is Seaside Crafter.